In general terms, the high chromium iron suitable for wear resisting applications fall within the compositional limits bounded by the austenitic phase field of the ternary liquidus surface of the iron, chromium, carbon diagram. Solidification takes place by a eutectic process The products of the eutectic reaction are austenite and chromium rich carbides of the (FeCr7)C3. 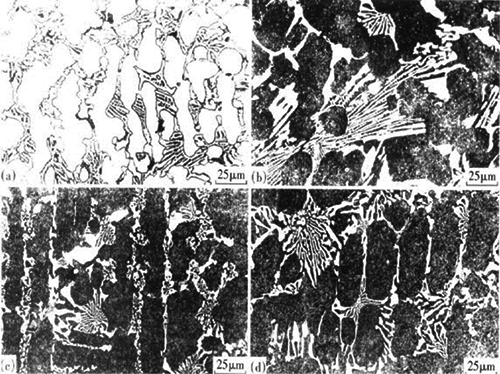 For high chromium white iron with a Cr concentration of some 18 – 20 wt% (hypoeutectic composition), solidification starts with the nucleation of dendritic primary austenite (γ), followed by the formation of γ + M7C3 carbide and its morphology have been well documented by several researchers. This entry was posted in Casting, Metallography, Microstructure, Uncategorized and tagged Cast Iron, High Chromium, High Chromium Cast Iron, High chromium white cast irons, white cast iron. Bookmark the permalink.